Arthur Dalby was born in Linton in 1898, the son of John Thomas Dalby and his wife Elizabeth. Arthur was the brother of Alan Dalby also listed on these pages. In 1911, Arthur was living alone with his grandmother, Isabella Swann in Linton. Exemption was sought by A. Dalby, 18, single joiner's apprentice, Linton, who in his spare time has to assist his father on his farm and garden, two brothers having voluntarily joined the Army. The father has nearly an acre of market garden, two acres of ploughing, and eight of grass, and also works an acre of garden and four greenhouses for another gentleman in the village: - The application was refused, the lad not to be called up before January 15th. The family clearly did not agree with this decision and a further appeal to Leeds was made, but this was rejected and Arthur was called up. Arthur was called up (mobilised) on the 18th January 1917 and became Gunner 204173 in the Royal Field Artillery (RFA). Arthur would have undergone basic military training and by the 9th May 1917 was posted to 42(R) Battery RFA. Arthur's military career was not without incident! On the 5th September 1917, while serving in Heytesbury, near Salisbury Plain, part of the artillery training areas, Arthur over-stayed his leave and was confined to barracks for 5 days. A few days later, on the 22nd September 1917, he was posted to France to join the British Expeditionary Force (BEF), and on the 30th September he joined 17 Brigade Royal Field Artillery. 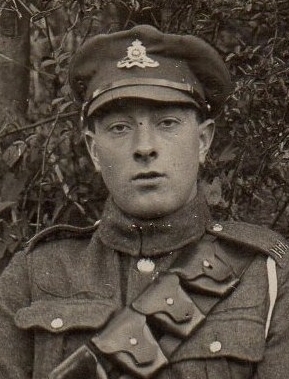 A later photo of Arthur in uniform showed a badge as a Gun Layer (the man who aimed the gun). Arthur's problems with military discipline again showed itself on the 28th November 1917, when he was absent from the 7am parade. He was given 4 days Field Punishment No. 2. In this punishment, the prisoner was placed in fetters and handcuffs for several hours but was not attached to a fixed object and was still able to march with his unit. The soldier was also subjected to hard labour and loss of pay. Unfortunately, Arthur was again absent from the 7am parade on the 29th December 1917 and earned another 3 days of Field Punishment No. 2. Arthur was admitted to 88 Field Ambulance on the 11th February 1918 with impetigo on his legs. He rejoined his unit (17 Bde) on the 1st March 1918, but his problem with early parades continued with an absence on the 17th June 1918 from the 8.15 parade that earned him another 4 days Field Punishment No. 2. On the 18th October 1918, Arthur was granted leave to the UK and he remained here until the 2nd November 1918 when he returned to France. Arthur was not immediately demobilised, and instead served for part of the time in Germany - on the 11th January 1919 he joined a Royal Engineer's workshop in Germany and stayed there until the 15th February 1919 when he rejoined 17 Bde RFA. Arthur's final brush with military discipline occurred on the 21st March 1919 when he was given 2 days Field Punishment No. 2 for ill treating a mule. Finally, on the 24th April 1919, Arthur was posted to A Battery of 113 Bde RFA, and he left that unit on the 16th May 191, until the 30th May, for leave in the UK. On 22nd September 1919, Arthur was at a final dispersal camp, before returning to the UK on the 25th September 1919 and he was discharged from the Army on the 30th September 1919.